Offer Basecamp® independently at your school with our free training and support. 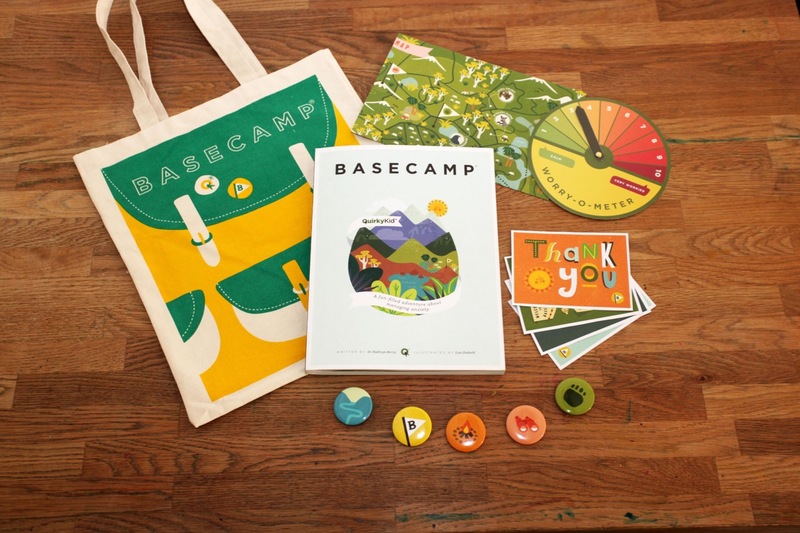 BaseCamp® is an innovative anxiety program for children aged 7 to 12 years old. Developed by Clinical Psychologist, Dr Kathryn Berry, and the Quirky Kid team. The program draws on decades of experience, combining a sound theoretical cognitive-behavioural approach with effective, engaging child-centred activities. Our adventure-based participant ‘guidebook’ has everything you need in the one, easy place to facilitate the games, activities, fact sheets, and psycho-education lessons across the entire program. Forget about photocopies and handling various materials. All the tools you need neatly packed together with amazing quality and care. You’ve heard it right. You can count on support from the programs Authors and a specialist Clinical team. Discuss participants individual concerns and needs, right here, whenever you need it. Our content is Australian National Curriculum ready, perfect for a school environment. Access manuals, lesson plans and instructions that are constantly being evaluated and updated. We make it easy for you to learn more about Anxiety and child development. The evidence that really counts is real outcomes. Standardised Psychometric Tools support the monitoring and outcomes of each individual or group, and make use of our free clinical support. Our programs have been recognised at international awards such as The London Bookfair International Awards 2018. The BaseCamp® program was developed in the clinic setting by Clinical Psychologist, Dr. Kathryn Berry, together with the Quirky Kid team, that included teachers and other educational and social development experts. There are two main structures. The target program can be delivered over 8-sessions, for group sizes of up to 8 participants. The universal program can be delivered to the entire classroom across one to two terms. The program is suitable for children who experience anxiety or worry. Typically, the programs is suitable for children aged 7 to 12 years. How much does it cost to my students? The individual cost per student starts at $80 and includes the individual workbook. All the supervision, support and regular customer service is included. Minimum orders apply. Who can to deliver the content? Our program can be facilitated by counsellors, guidance officers, psychologists or pastoral care professionals that have completed the appropriate Basecamp training and have formal training with CBT. Our school is based in a regional area, can we use the program? Yes, the program can be implemented anywhere in Australia, and even overseas. management packaged creatively in one concise program. Basecamp® contains engaging chapters that include stories and diverse activities like role plays, cooperation, craft, knowledge acquisition and field work. Each Australian themed location within the program is linked to a corresponding anxiety treatment component. anxiety in children aged 7 to 12 years. Three years in the making, now ready for you. We hire the best to create beautiful learning materials so your students and parents will engage more easily on every occasion.